1. I resolved not to share prayer requests about anyone other than myself, unless I’ve explicitly asked their permission. 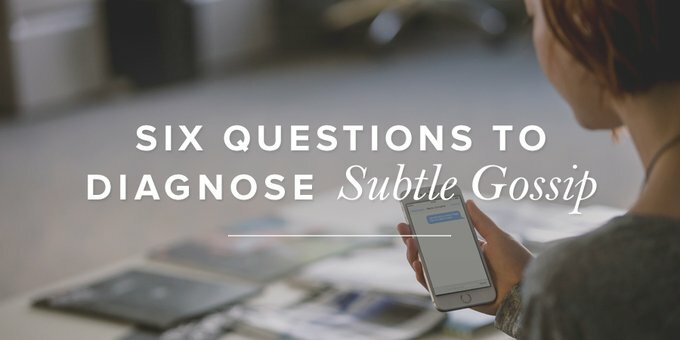 Adapted from "Six Questions to Diagnose Subtle Gossip" originally posted at DesiringGod.org. Paula has served with Revive Our Hearts for thirteen years. She is the author of Confessions of a Boy-Crazy Girl: On Her Journey from Neediness to Freedom. There's nothing she loves to share more than the gospel-centered truths that have so transformed her own life: what it means on a daily basis to be "dead to sin, alive to God, and in Christ Jesus." Paula, Trevor, and their son, Iren, make their home in New York.